What a lovely treat unwrapped, the delicious chocolate covering, with the pleasant nuts scattered through. Only hubby loved these for a long time, than I finally tried them, now I’m hooked. Like me i love marshmellows peanuts and caramel and this is what this is but all in one such a yum chcocolate bar who cares that its full of sweet its yum!! Mars Snickers bars are just so yummy and I like to eat them chilled straight from the fridge. They have a terrific nutty chocolate taste. I have to really be in the mood to eat snickers. I don’t choose to eat chocolate with nuts, usually it’s in a favourites box or something. Not a bad taste, a nice contrast between the nougat and the nuts and choc. Although I like the taste I find myself spitting out the nuts as I can’t handle chewing them and getting them stuck in my teeth. Mars Snickers seem to have maintained the same recipe for many, many years and I’m so glad because I love chewy Snickers and always have. Mars Snickers is one of the chocolate bars that is so delicious and perfect for a snack at work.The textures are amazing and it is such a delight to eat! I do like the snickers bar. I like the combination of the chocolate, nuts and caramel. the nuts gives it texture and they go great with the chocolate and caramel. I think the sayings are true, you’re not you when you’re hungry! 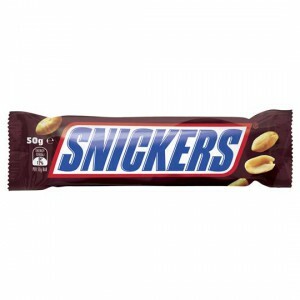 I love Snickers and they really do satisfy. I love the chocolate, peanuts & caramel. Yummy! How would you rate Mars Snickers?